Ribes nigrum (blackcurrant) oil, Lycium barbarum (goji berry) extract, Rubus idaeus (raspberry seed) oil, Hibiscus sabdariffa (hibiscus flower) extract, Gandoderma lucidum (Reishi mushroom) extract, essential oil fragrance of blackcurrant: d-Limonene+, geraniol+, linalool+, citronellal+. + Component of essential oil. 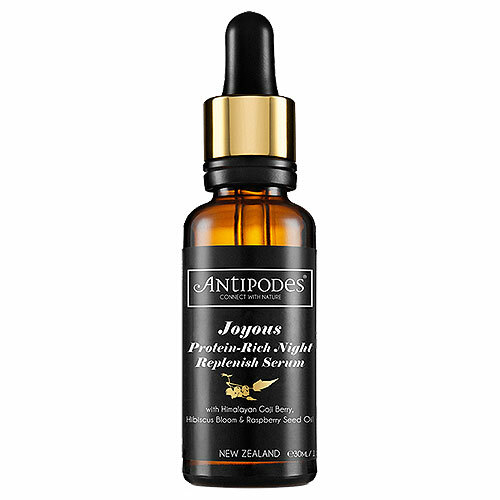 Apply at night to your face, neck and décolletage before your favourite Antipodes moisturiser. 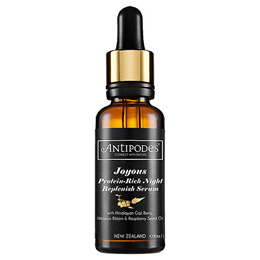 Below are reviews of Antipodes Joyous Night Replenish Serum - 30ml by bodykind customers. If you have tried this product we'd love to hear what you think so please leave a review. Beautiful oil. Smells divine and leaves my skin nourished, plump, smooth and feeling great. Highly recommend. Rescue dry, damaged skin with this silky night serum. Himalayan goji berry boasts up to 19 amino acids to help optimise your skin’s appearance.